Compact and versatile undersink filtration systems eliminate chlorine taste and odor for great tasting, clean water. Great for apartments and single dispense-point applications like bathrooms, ice makers, and wet bars. 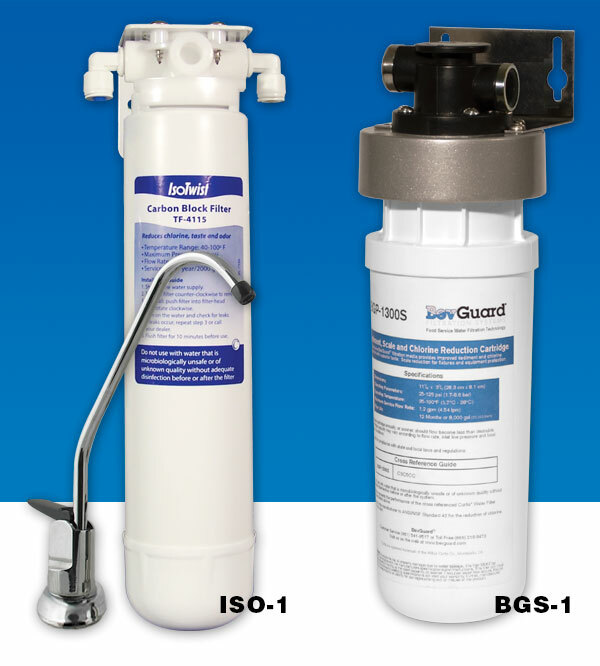 Eliminate chlorine taste and odor for great tasting, clean water with these 2 great low cost and compact filter systems. Great for apartments and single dispense-point applications like bathrooms, ice makers, and wet bars. A quick change system makes it easy for anyone to change filters. For use in city water applications. The ISO-1 has a 2000 gallon capacity and comes complete with connection hardware, tubing and separate faucet. The BGS-1 has a 10,000 gallon capacity and a flow rate of 1.67 gpm. Directly plumb it into cold water line under the sink.